Quite often, the results have been pretty good. The First, Ember in the Ashes, The Name of the Wind, etc., all good books I may never have read if I hadn’t started this. Negative results have been far less frequent, though Skinwalker springs to mind in that regard. But now, for the first time, I’ve gotten a result that isn’t particularly good or bad. I didn’t think it was possible, but I’ve had a “neutral” result. 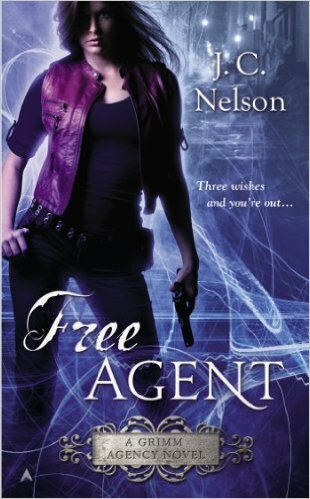 I read Free Agent, by J.C. Nelson, at the recommendation of a good friend. The first of the “Grimm Agency” series, it follows the adventures of one Marissa Locks, who works at the agency in question, which carries the name of its owner and director, Grimm, a Fairy Godfather. Through him, his agents take on all sorts of jobs, including, among other things, finding missing persons, rescuing children from werewolves, dealing with unruly supernatural creatures, and setting up princes and princesses for “happily ever after,” or so the princes and princesses believe at the time (apparently there are divorce rates to be seen). Whatever the job, Marissa does it, like a good little indentured servant. She and her parents traded her freedom to Grimm the Fairy Godfather in exchange for saving the life of her little sister. Working for him, she earns “Glitter,” which is apparently the gold-dust equivalent of magic, and when she’s earned enough to pay off her debt to Grimm, she goes free. That is the whole of her life now: working off her debt. Seriously, that’s all she does outside eat and sleep, and all she has done for six years now, and she’s barely halfway through her debt. Needless to say, hers has become a hollow life. So, she doesn’t hesitate to go through another matchmaking setup, which apparently involves briefly dating and then breaking up with the prince in question so the princess can then happen to come along and repair his recently-broken heart. This time, however, a few things go terribly wrong, not the least of which: the warmth he brings into her empty life is so strong that she falls for him. And thus begins the trouble. As Marissa tries to juggle several interconnected cases involving the well-being of her “prince,” babysitting a princess, the intrigues and betrayals among the royal families of a magical Kingdom, pulling the world back from the brink of a supernatural war, and the looming return of an ancient evil or two, things get very personal for her. Skimming around spoilers as much as possible, the whole conflict comes to hinge on the bonds that form between her and one or two people, versus those she once had, or thought she had, with her family. For the first time in a very long time, she lets real friends enter her life, and for them, she will do pretty much anything. The entire world at stake, and, for her, it all comes down to one or two people. Now, here’s where things get both good and confusing at the same time. One would think that a fairy and his staff would understand that the devil is in the details, but Marissa seems to be the only one paying them any attention. Sure, the world’s in trouble, they’ve got bigger things to worry about than only a couple people, but considering the mounting evidence that these two people should just happen to play a pivotal role, I’d say it’s worth investing a bit in looking at the details to get a better understanding of the big picture. Marissa knows this, and uses it to quickly and efficiently learn things that everyone else overlooks because they’re thinking too big. And speaking of details, there are so many details dropped in this book, usually to create a humorous tone, which indicate all sorts of disturbing things about this world. I am currently thinking about toy poodles when I say this, and the need for hellhounds to keep the population of such under control. But I digress. I can understand there being a certain lack of affection between Marissa and her colleagues, but I just couldn’t grasp why they (and others) were so hostile to her and always assumed the worst of her. She did her job, and did it quite well, based on the instructions she was given, and even gained the agency some very good and useful cred among the supernatural powers that be. Yet the chiefest of her coworkers says all she does is look pretty. This makes no sense whatsoever. Of course, neither did Marissa’s own claim of being the best agent Grimm ever had. And neither did the way he and his agents and Marissa all handled each other and the situation at hand. When you need to bench someone, why not just explain your reasoning calmly and clearly, instead of resorting to personal insults and attacks? Basically, there were great swathes of their behavior which I just did not understand. Perhaps that’s a me thing – people in general are confusing – but almost everything felt like it was happening “just because.” That went all the way up to the climax, which, in some ways, felt anticlimactic. With all that, I had some trouble investing in these characters, or even enjoying what they got up to. I think I liked Marissa’s date to the worst pub in town, and I could appreciate the walls around her heart slowly crumbling down, and, finally, her little trick that won the day was certainly original and tragic at the same time. But outside that, most of the book just felt kind of lukewarm to me. Not necessarily bad, but not particularly good either. Lukewarm. Neutral. Rating: I’m giving this one 6 stars out of 10. This entry was posted in Books, Tuesday Review and tagged Free Agent, Grimm Agency, J.C. Nelson, Marissa Locks. Bookmark the permalink.